A few months ago, the kind folks over at Robert Kaufman asked me to participate in a group quilt exhibit for Quilt Market/Festival centered around their Kona Color of the Year. This year that color is Highlight, a bright neon "highlighter" yellow. 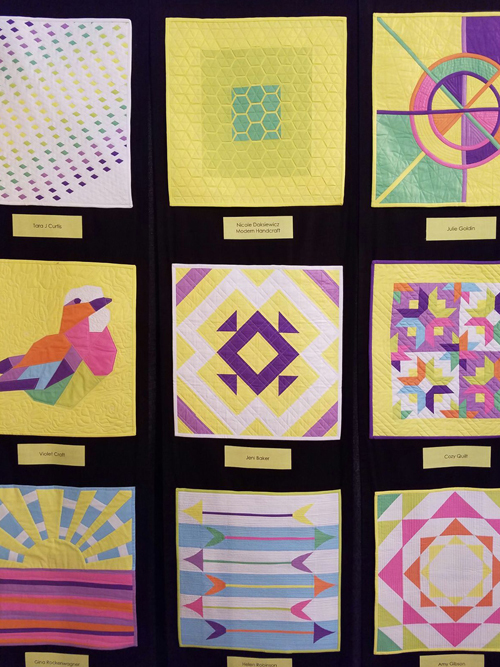 The exhibit featured mini quilts from 60 quilters, who were each sent a bundle of solids including Highlight. 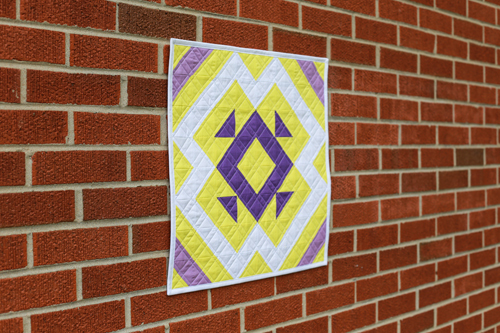 We were asked to make a 20" square mini quilt, using only those fabrics. We could use as many or as few was we liked, but we had to use Highlight. It was an honor to be asked to make something for this special exhibit! I've had quilts hung at Quilt Market before, but never in the quilt exhibit area, or at Fesitval. Jacey was kind enough to take a photo of my quilt hanging up at the show. So cool! 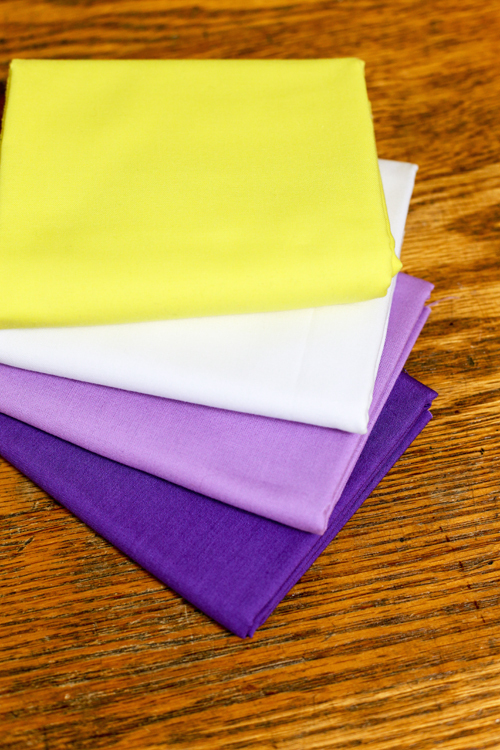 The colors in my bundle were a full rainbow of bright pastel solids. I chose to use two purples from my bundle in addition to white and Highlight. I struggled for a while to decide on what design I wanted to make. The instructions were to make something that reflected our individual style. That made things a bit easier, I knew I had to use half-square triangles. Photo is © 2016 Robert Kaufman Fabrics. 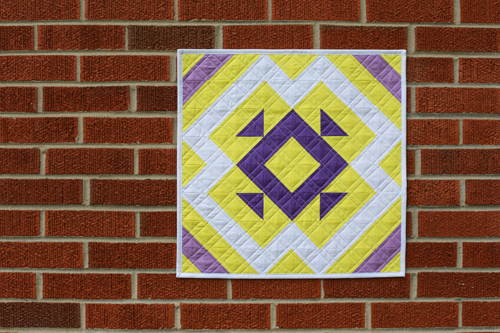 I ended up making a block from the Convergence quilt in my book, Patchwork Essentials: The Half-Square Triangle. Pick up a copy of the book here. 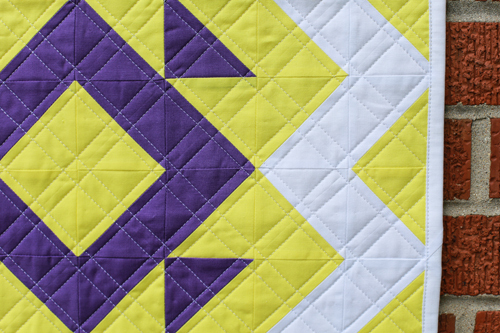 For the quilting, I extended the lines created by the seams of the half-square triangles and stitched 1/4" on either side of those lines. It ended up creating an interesting cross-hatch effect. After seeing all of the quilts in the exhibit (you can see them on Robert Kaufman's Instagram, here), I wish I had thought a little more outside the box with my design. 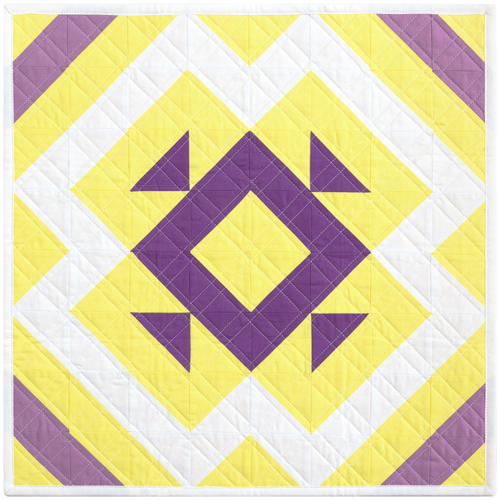 The quilts are all so different, and while I thought I was adding interest to mine in the quilting and scale, I feel like it fell a little flat. I've been thinking that I've been in a bit of a rut lately in terms of design, it's time to figure out how to get myself out of it. A plan of attack is forthcoming. Regardless, it was a fun project to work on. It was wonderful to be included with so many talented quilters. The exhibit will be traveling, so keep an eye out! OK...while you may be feeling a bit flat and one Dimensional as a designer right now your quilt block shows well on that wall. It was placed in a position that brought the eyes front and center (according to the pics I saw) and more then held its own. So while you may be more then ready to head off in other directions, for lots of different reason, this block stands well on its own in this display. After I saw the picture, I think your plan is the best use of Highlight. I don't know what you see, but the color is emphasized and complements the purple beautifully. While you may think it falls flat Jeni I actually think it really stands out when put with the others. I think your design certainly emphasizes the colour and I would happily have it hanging on my wall. This is beautiful and very striking with the purples and yellows. Love it!! 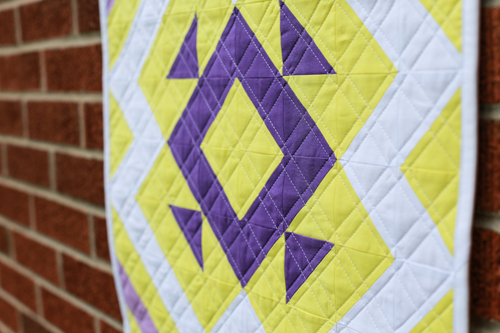 I really love the boldness and simplicity of your quilt! I'm a big fan of 'clean' design and think you have captured that perfectly. That simplicity highlights the fabric so well. I could not say it better than the commenters before me so I will just say ditto! I LOVE your quilt! Purple really makes it behave! !